The Trafalgar Square riots of March 1848 were the first signs of a wave of radical unrest that swept London that year. This page tells that story. GWM Reynolds. Journalist, Chartist and chair of the Trafalgar Square meeting. The first serious disturbance of 1848 took place at Trafalgar Square – then still under construction, with newly laid roads and hoardings around Nelson’s Column. 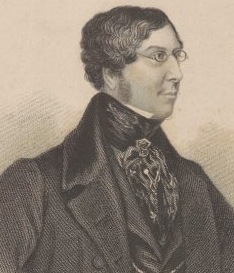 A planned protest against the then relatively novel idea of income tax had been called by Charles Cochrane for Monday 6 March. Under pressure from the police, however, he reluctantly withdrew and made efforts to cancel the open air meeting. London ‘s workers were having none of it, and a crowd estimated at 10,000 strong gathered anyway; the journalist and relative newcomer to Chartism GWM Reynolds took the chair. Though observers later commented that barely a man in the crowd would have been liable to pay income tax, the meeting duly condemned it, congratulated the French people on their efforts to overthrow their government, and made clear their support for the People Charter. At first all went peacefully. But according to the admittedly partisan Northern Star, just as the crowd began to dissolve “some sleek well-fed man asserted that the people assembled were lazy and would not work”. In the uproar which followed, the police moved in with truncheons flying and a riot ensued. It was 1am before peace was restored, and by 9am the following morning the crowd was back, erecting a barricade in Charing Cross next to the statue of Charles I. All that day and into Wednesday 8 March the fighting continued. David Goodway, in his book London Chartism 1838-1848, notes that the authorities built up their forces over these days. On the Monday, there had been just 1,189 police on duty or reserve in London ; two days later, there were 2,460. By Friday, The Times was able to report that “scarcely any traces” of the week’s excitement now remained. In all, 127 rioters were arrested between Monday to Wednesday. As Goodway notes, the striking feature of those arrested is their youth – nearly half being under 21 years old. The names of those arrested, taken from police records now in the National Archives (Ref: MEPO 2 64) are set out in the table below. Goodway names the leaders of the riot as John White (“an eighteen-yearold wearing epaulettes, smashing windows.. and shattering and extinguishing the gas lamps…”), and Charles Tothill (“a clerk, aged twenty”). Strictly speaking, these were not “Chartist” riots – the only Chartist connected with them being Reynolds, whose initial meeting being entirely peaceful, and the Charter being just one of a number of causes favoured by the crowd. But unlike the strikes of 1842, the Chartist leadership this time did not hesitate to place itself at the head of popular feeling, and as the “year of revolutions” went on, some Chartists at least would turn to more radical solutions. Events in Trafalgar Square would also help to cement the political reputation of Reynolds, whose Reynolds’s News would later become the principal and longest-lived of the radical newspapers to emerge from Chartism.